Just in case the publisher's summary doesn't grab you, I'll tell you what pulled me in: literary werewolf novel blurbed by Stephen King. Sounds right up my alley. 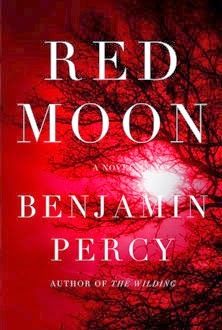 I'm not big on paranormal romance, but the whole idea of werewolves with a literary bent excited me. I'm going to address the heavy-handedness of the allegory of this book in the Entertainment Value section, but I feel like I have to mention it here too because it was problematic for the writing as well. The characterization, plotting, and pace all suffer from being forced into the mold of the message the book was trying to convey. More below. Here's my major, major complaint about the writing itself: the total lack of action. It's a book about werewolf terrorists, so obviously lots of stuff ought to be happening. Instead, the author does that horrible thing where the tension builds, you can tell a big event is coming, we're rushing towards the climax...and then the chapter ends. When the next chapter opens, the big event has already taken place and we're hours, days, even weeks later dealing with the fallout. We don't get to see the bombs explode or the characters fight it out. All we get is the lead up to the big event and then the aftermath. Why can't we see the action? I really respect King as a writer, so I had to wonder if we read the same book. In my personal opinion, this book is straight up allegory. And the only way it could be more heavy-handed is if it included footnotes that say "Do you get it? DO YA???" We have a community of werewolves, known as Lycans, who are heavily policed in their home country and in the United States as dangerous insurgents. They respond by using airplanes to perpetrate terrorist attacks on the United States. The US quickly becomes involved in a war with the Lycan terrorists - one that involves the military policing the home country of the Lycans. Do ya get it? The actual plot, characters, and action all suffer because the author is so wrapped up in the allegory and making a point. I didn't want to read an allegory about the War on Terrorism and foreign affairs during the Bush Administration, I just wanted to read a book about werewolves. I was really let down. This one had been on my list forever and I was excited to order it for our library when I did a selection of horror/paranormal titles around Halloween. The lack of action, the problems with pacing, and the heavy-handedness really ruined the book for me. I certainly wouldn't characterize it as horror and it really is more about the allegory than it is about the paranormal. I was unimpressed and can't recommend it.